How often are you sending documents that contain important information? Are you always sure that recipient is the only person that can access and read the document? Protection of confidential information plays a significant role in everyday life when it comes to important information being sent to other people. One of the best solutions for privacy protection is PGP and its Open Source implementation – GnuPG (GPG). However, there are no utilities that offer user-friendly interface, easy navigation, and stable work at the same time. We did our best to put together all those features and developed an open source solution – WinGPG. WinGPG is a tray-based classical Windows application that executes GPG (via GPGme library) with proper options. We decided to keep it simple: a special “shell” for GPG is simplified and is really native (not a Linux port). The application registers shortcuts and extensions in your system, which provides better usability. It has been proved that encryption method that is used in GnuPG is really good, so cryptography was left without any modifications. No complicated setup, just run a batch file. Automatic zipping at encryption time. Your files are ready to be transmitted via email or messenger immediately, without any extra steps. An open source solution. We believe in freedom. Key management (create, import, export, revoke). WinNT Explorer support via context menus, works for Total Commander and FAR. Global shortcuts work from the active explorer window and clipboard. Clipboard supports both texts and files. WinGPG has many nice tricks and options, like global accelerators, file types registered to WinGPG, etc. 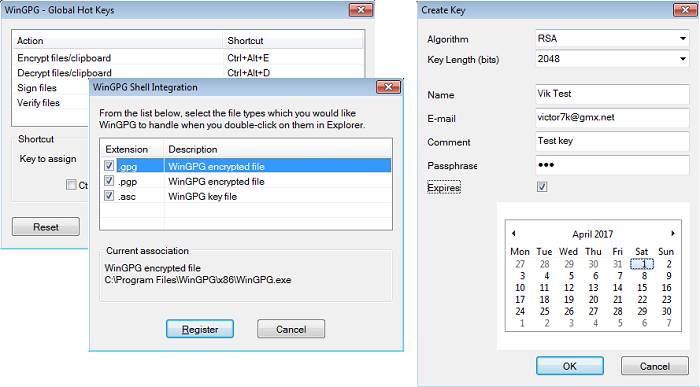 This is a fully functional tool, which offers you an opportunity to manage keys and files easily. We keep working on the most important and widely used features. But the primary goal is to let you do simple things easily and in a comfortable way! This product is provided under GPL license. Free download available from the product page.